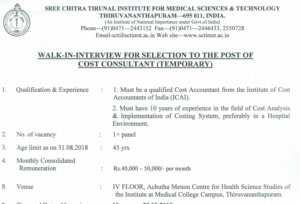 SCTIMST Coast Consultant & Junior Social Worker Recruitment 2018 – In the latest job vacancy recruitment notification today, Director and Administrative Officer Grade I of Sree Chitra Tirunal Institute for Medical Sciences and Technology, Thiruvananthapuram has undersigned, scrutinized and published an official notification for walk-in interview for selection to the post of cost consultant (temporary). There is 1+ Panel vacancy for which Interview will be held on 29th September 2018 at 10:00 AM. In the absence of candidates with requisite experience, meritorious candidates with requisite qualification but less experience may also be considered at a lesser salary. Only for the selected candidates who holds good qualification and experience will get Rs. 40,000 – Rs. 50,000/- per month salary or monthly consolidated remuneration. Now most important is to learn about Qualification and experience which demands that candidate must be a qualified Cost Accountant from the Institute of Cost Accountants of India (ICAI). Second, the candidate must have a minimum of ten years of experience in the field of Cost Analysis & implementation of costing system, preferably in a Hospital Environment. Age limit to apply for the post is 45 years as a maximum when counted on 31st October 2018. Interested candidates may appear for Walk in interview along with bio-data, original and attested copies of certificates to prove their age, qualification and experience etc.